We've been incorporating the tips from 'Managers Of Their Homes' recently and if you missed my first post about the book you should check it out here, because my whole world has changes since I first read this book and now I'd like to follow up with some of the key things we've implemented in the Garcia household. Now, transitioning to and building up to our schedule took a bit of work but its been slow and steady progress and I'm happy to be slowly reaping some of the fruit to my labor. 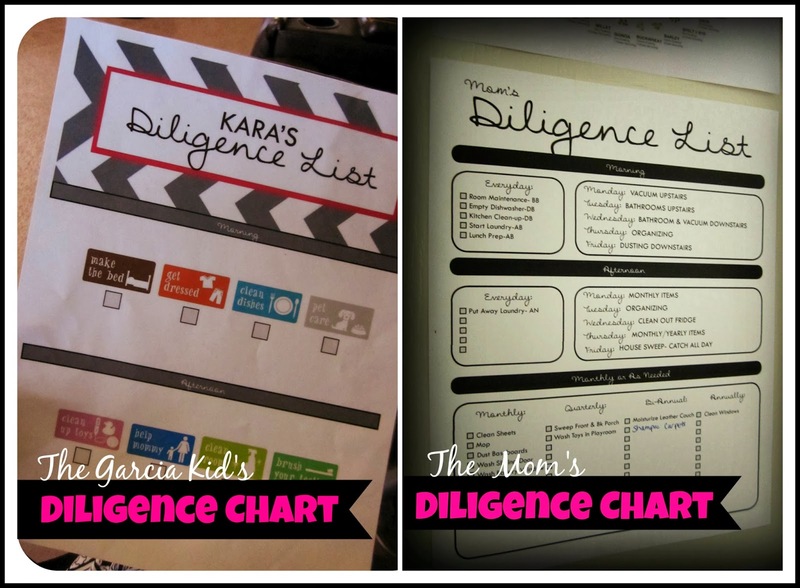 My first thing to work on was our chore chart, which we are now calling our "diligence chart". God calls us to be diligent in all we do, so I like to think that doing our work is not a chore but an opportunity to work diligently. 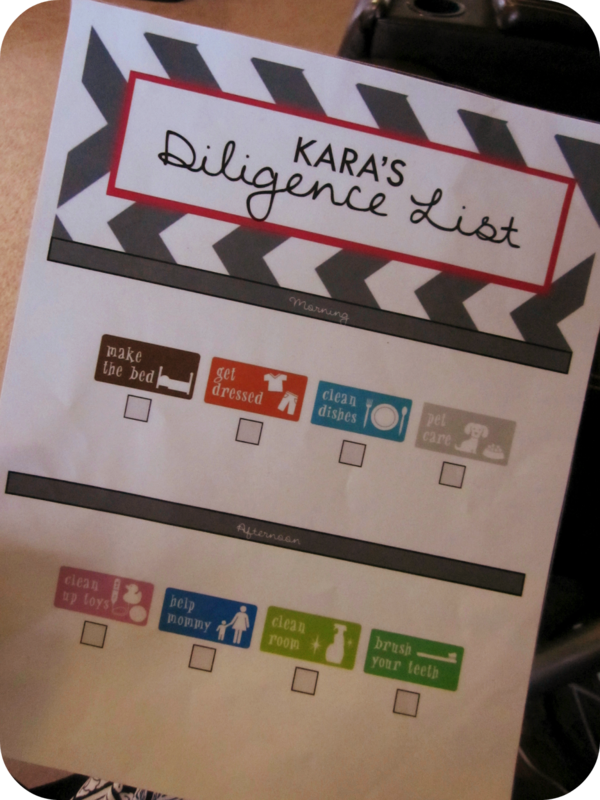 I started by making Kara her own diligence chart (age 4) and spent a few days training slowly how to do her chores. She can mostly do them by herself but I wanted to spend the time to make sure she was doing them correctly. There are a few she does as needed but on her chart are the ones she has to complete on a daily basis. I require her to complete her morning chores before she can have breakfast or play. Since she only has a few it works out well. 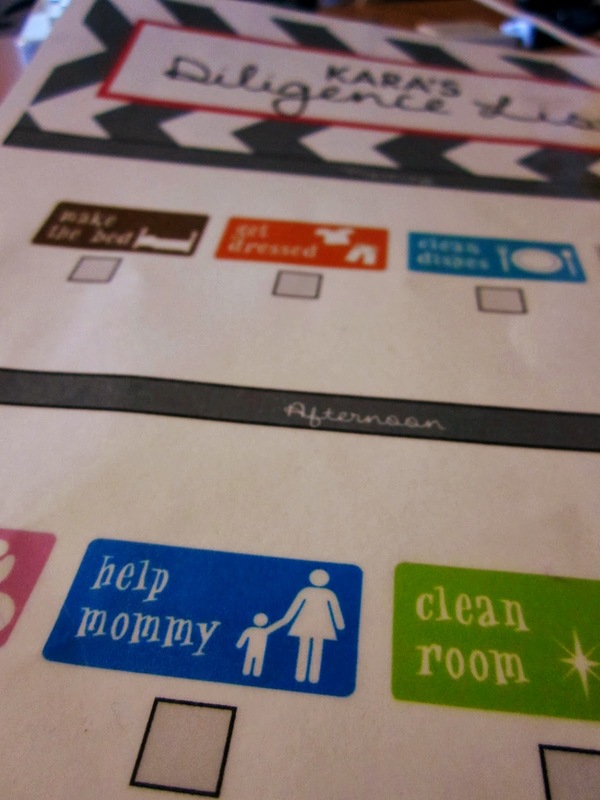 Then after breakfast I usually have her do a simple task, like wash off her table or help me with my chores a bit (more chances to start training her to add chores to her chart eventually). Below is my own diligence chart. The way it gets broken down is by Morning and Evening on the top portion of the sheet and then the Monthly/Quarterly work that needs done on the bottom portion. During the Morning and Evening on the left side it lists my diligence work to get done everyday. This includes things like: unload the washer, clean kitchen, start laundry, lunch prep, etc. On these things I have included a BB, DB, or AB which stands for Before Breakfast, During Breakfast, or After Breakfast. 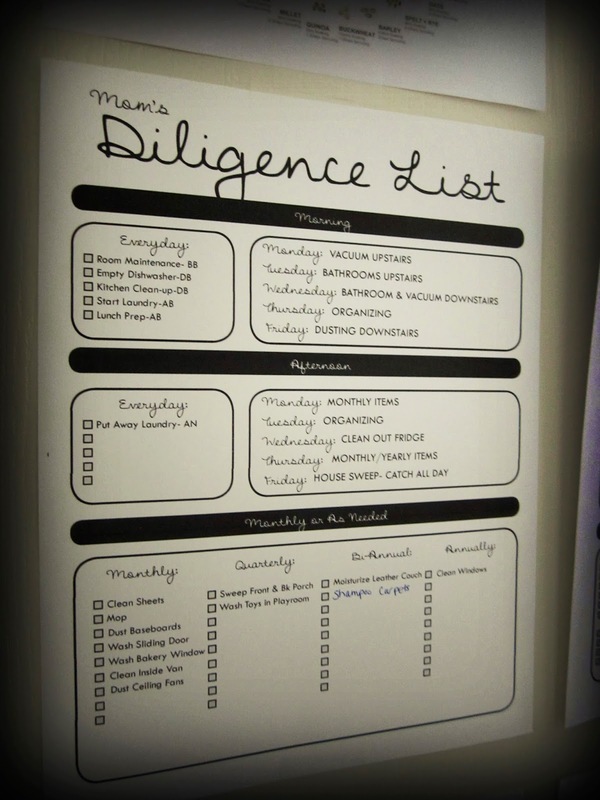 Then along with my daily chores on the right hand side I include a weekly schedule of diligence work to be done on specific days. So, for example Monday morning I along with my everyday work need to vacuum upstairs. Then in the evening on Monday I need to do one of my monthly items listed at the bottom. I left extra room on the bottom for more monthly, quarterly and yearly chores as I think of them. Once I feel my list is completed I will laminate the list and then check off the monthly stuff so I know what is completed. This chart has helped me keep up with and maintain the things that use to overwhelm me. I just have a designated time to do it and it doesn't take as long as what it would if I let it slide for weeks, like in the past. Plus, a big part of our conviction is having a house centered around hospitality and I've found when I keep up with my diligence work I feel like I can use our house to bless so many more people. If my house is in constant disarray the last thing I want to do is invite a new couple from church over. The second thing that made a HUGE impact in our house was my dishes routine. I've always heard that its good to get dishes done before you go to bed but that didn't ever work for me because either I had a whole sink full of caked dishes that needed soaking, or that didn't even all fit in the washer. Or it's even worse when I went to load the dirty ones only to find out I need to unload the clean ones! And at 11:30pm at night it's just not worth my time. In going through this book (Managers Of Their Homes) and reevaluating our dishes as a family, I realized that we are a 3/4 dishes family. Which means they sit in the dishwasher one day and then the next day it gets full midday and I send them through sometime later. But it just caused a pile up because by the time the dishes were done I already had a sink ready to load up. So it's just a cascade effect. Implementing the dishes routine: setting a specific time to load and unload the dishwasher. Since we are a 3/4 dishes family I implemented Ryan to be the one to send the load through at night before bed. The big thing here is that he sends it through whether its full or not! This may sound a bit wasteful but to keep my sanity and household running smoothly I will pay the extra $1. Then I am the designated unloaded at breakfast time, since I just snack at breakfast anyways. This prevents a pile up for the rest of the day. Larger families may need to have a designated time to load/unload twice during the day. Doing this has honestly brought such relief to me. I get so frustrated and overwhelmed if my kitchen is in disarray. With the dishes being taken care of I don't get overwhelmed like I used to AND I can now sit down if I want and take a break knowing there's not a sink of dishes waiting to be done like there used to be. I will have more of the things we have implemented in another future post, so look for it. Until then, God Bless!